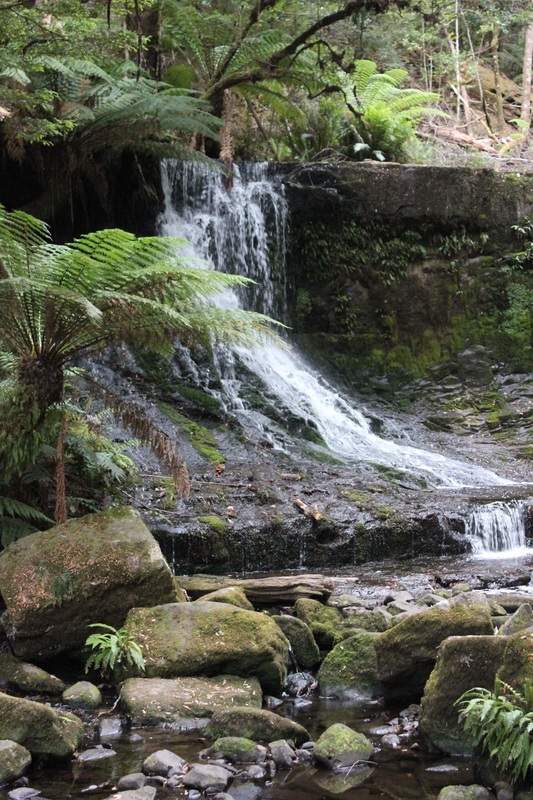 Mt Field in Tasmania is apparently one of Tasmanian's most loved parks. The proximity to the city of Hobart makes it a logical choice on why its so popular. 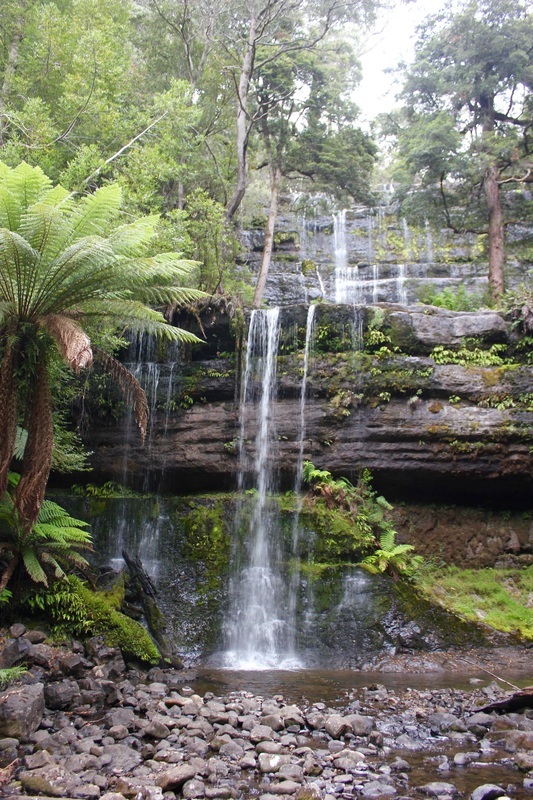 The big attraction here are the Russell Falls, which are an easy stroll from the carpark. In winter you can travel to the section of the park known as Lake Dobson where there are ski fields, but when we visited it was a hot summer weekend. One of the main reasons we chose this place to camp was because of the inviting title it has been given "Land of the Giants Campground" . 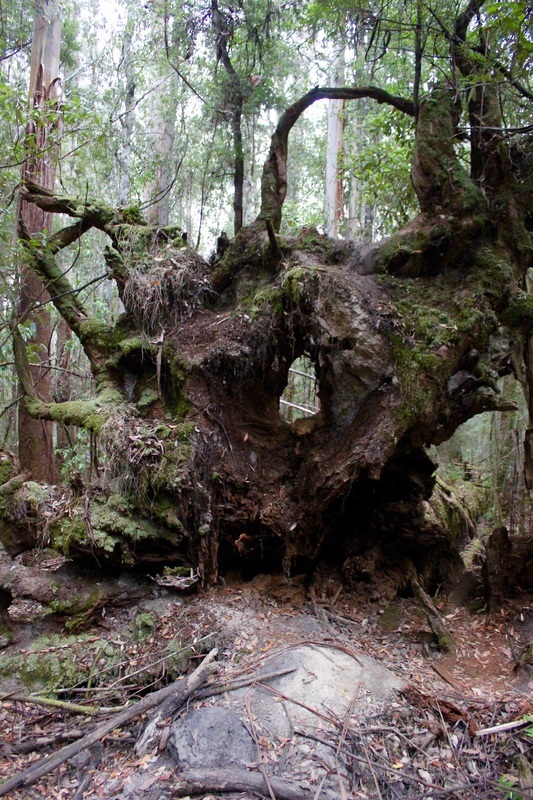 The name is derived from the fact that contained within the Park are tall trees (up to 100m high Swamp Gums). It just sounds like an intriguing place to visit and stay. Getting to Mt Field from Hobart is an easy drive, which you can complete in around 1 hour. 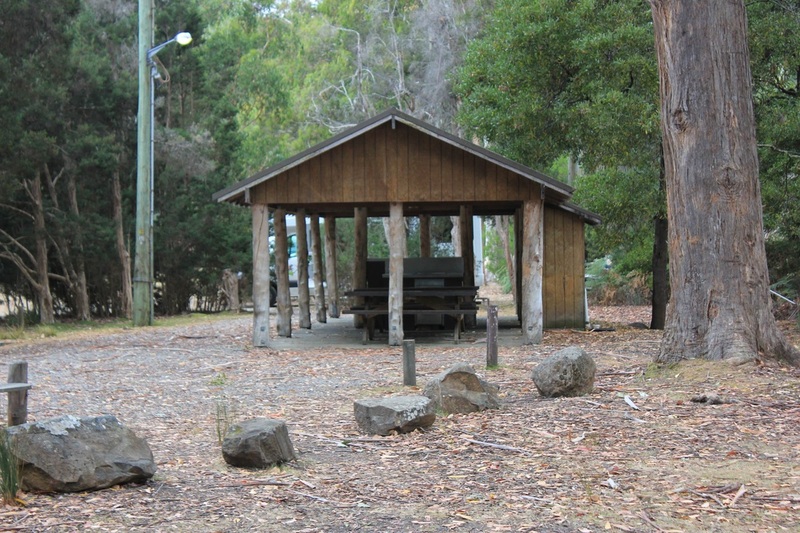 The campground is located just pass the Visitor Centre as you enter the Park. If the Centre is open when you visit, you can go and pay your camp fees there (plus remember you will need a Parks Pass as well for any National Park you visit). If you arrive late, there is a self registration booth located at the entrance to the campground. At time of writing, the fees were very reasonable. We paid $22pn for our family at an unpowered site. Full fee information can be found at the PWS website here. 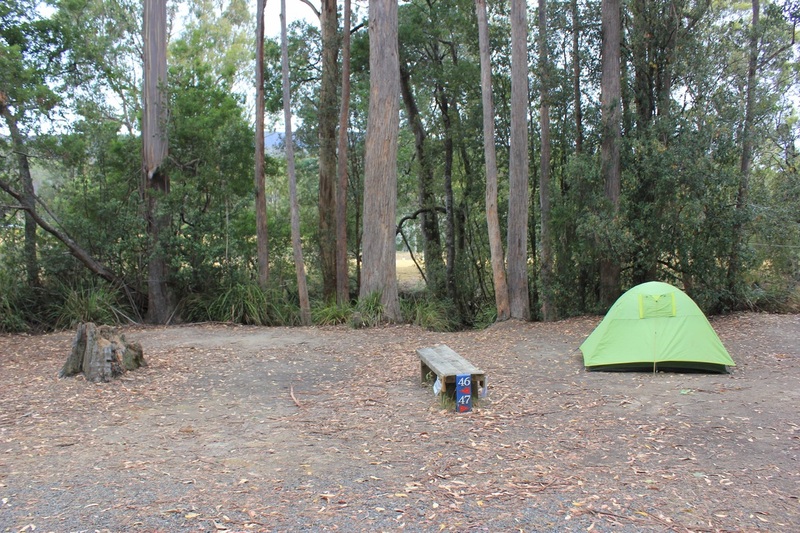 Note: They do not take bookings, so this campground works on a first in, first served basis. The powered and unpowered sites are separated, and you come across the powered sites as you first enter the shady and bushy campground. As is fairly common with powered sites, they are all very close together and offer not much privacy from one another. Probably if this is the way you camp, you are used to this set up! Scattered around the rest of the campground, amongst the trees are the 26 unpowered sites, which are all numbered so you can clearly see where your campsite is. Once you have found your spot, next to the number, you attach your receipt for camping which clearly indicates your arrival and departure date. 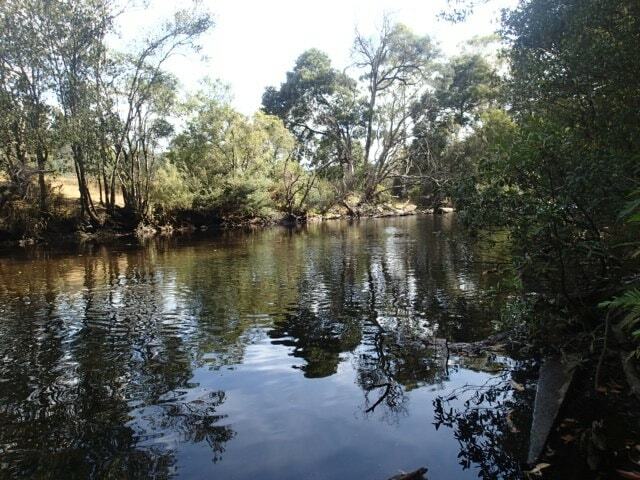 The campground sits beside the Tyenna River, a peaceful pretty river, which had many people cooling off in the river on the hot day we arrived! 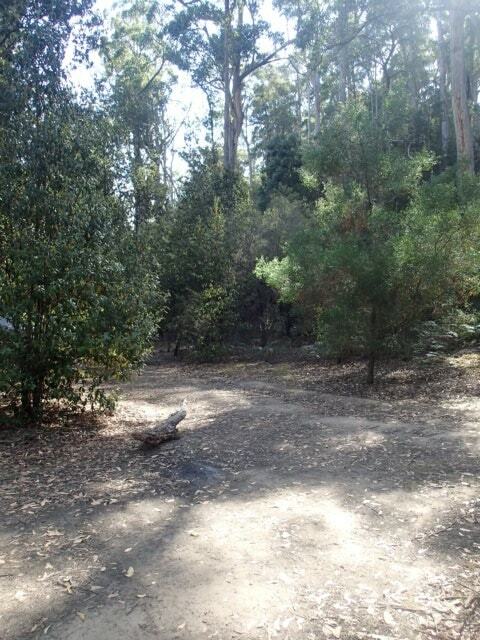 The campsites in this area are all shaded, but privacy between the sites is not great. 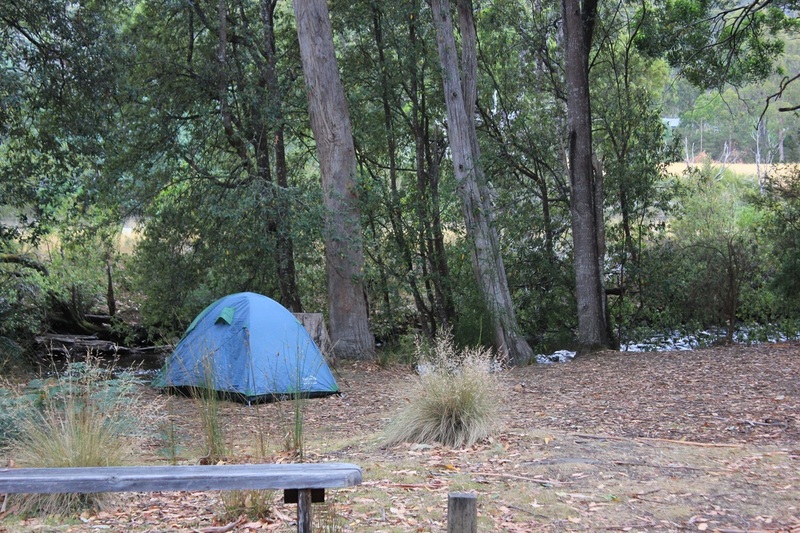 You are relatively close to the other campsites, but you never feel crowded. Looking towards the river makes this area very tranquil, and the sites closest the river are definitely the best in my opinion! Apparently, if you are patient and quiet you can see a platypus in the river, but we never did manage to get to see this elusive animal. Did see a few trout in there though! Nearly all the campsites had table/benches at them in the unpowered tent section. Photos of campsites are found below. 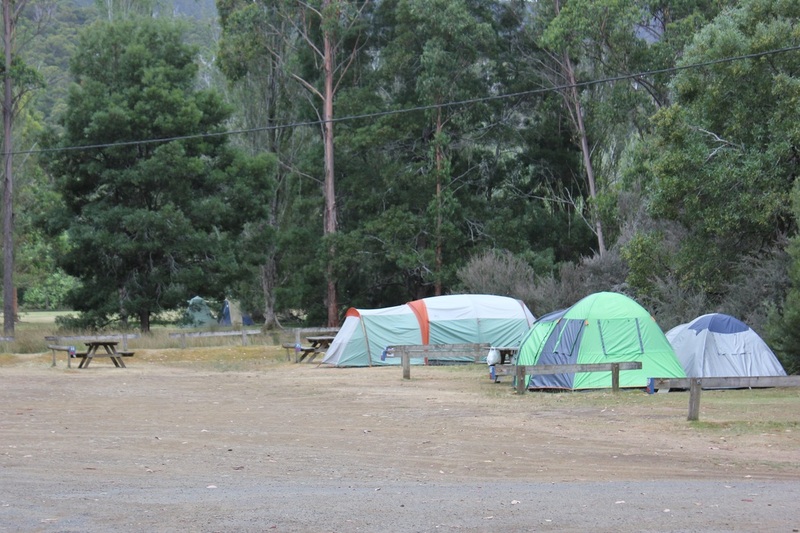 Note: We did see people camping closer to the day visitor area and not in the campground. I am not sure how that came about, and if they were the overflow from the campground. If the campground is full, suggest you speak with the rangers at the Visitor Centre to see if that is an option. 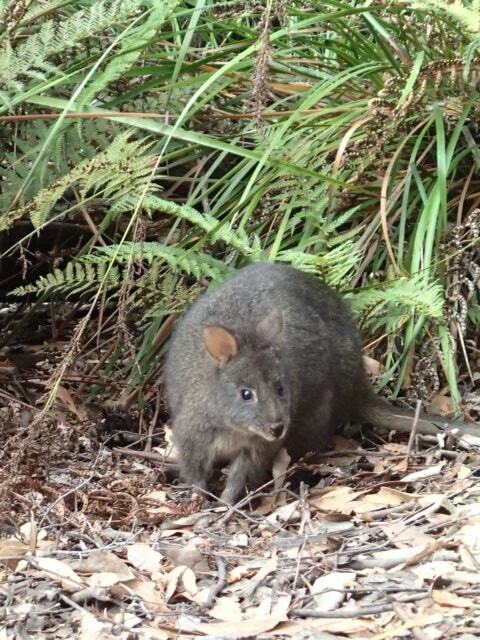 At night, the campsites get pademelons visiting - keep food locked away from them as they are inquisitive little creatures. This isn't the best picture of them but they are all over the place! 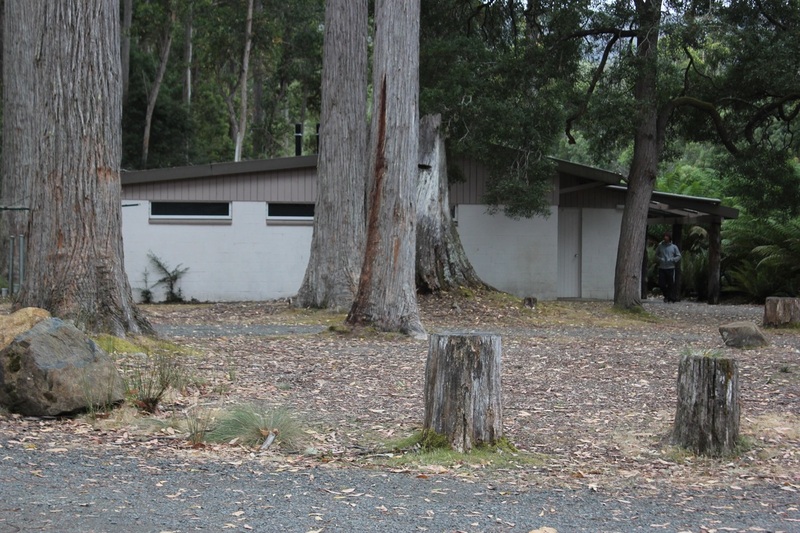 There is one central amenities block between the unpowered and powered section of the campground and it has about 4 showers and 4 toilets in the women's section, and I think less toilets in the men's section (but not 100% sure on that crucial matter). The toilet/shower block was clean and whilst not the most modern, had lovely hot showers! The campground was fairly full but there never seemed to be a long wait to use the showers; everyone seemed to stagger their shower times throughout the day and night. Next to the shower block was a laundry. What a fantastic and welcomed concept to have in a National Park. We definitely needed some washing done by this part of our trip, and its the first time I have come across a National Park that has this facility. There is a camp kitchen here in the campground, but its one of the more basic/rustic ones but still we appreciated having something like this in the Park. It has a washing up area (with hot water), a couple of outdoor BBQs and seating. No other camp kitchen equipment. See picture below of what it looks like. The Visitor Centre has a cafe that is open till 5pm, which serves a range of meals and drinks and was a pleasant spot to have lunch and relax after doing one of the longer walks. You can buy souvenirs, limited supplies plus learn about the Park and what it has to offer. Additionally, as you leave the Park, take a right hand turn, and down the road you will find a pub - about 400m from the Park's entrance. It serves great burgers at a great price, plus a range of other delicious food options! Recommended. 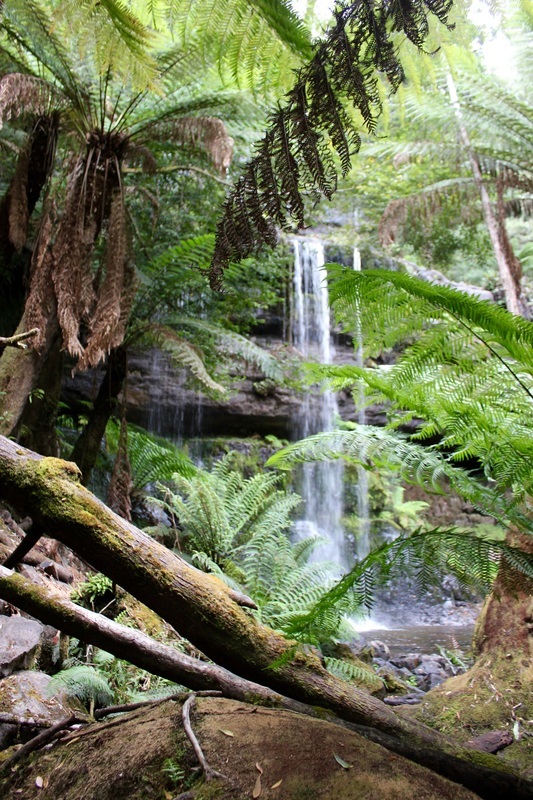 If you want to do more than sit at your campsite, and admire the Tyenna River and look at pademelons there are a range of walks in the National Park. The Visitor Centre, located shortly after you enter the Park, and within walking distance from the campground is a good place to find out what to see and do. Of course the walk to Russell Falls is an obvious choice - to see it without hordes of tourists, go early morning or late in the day. 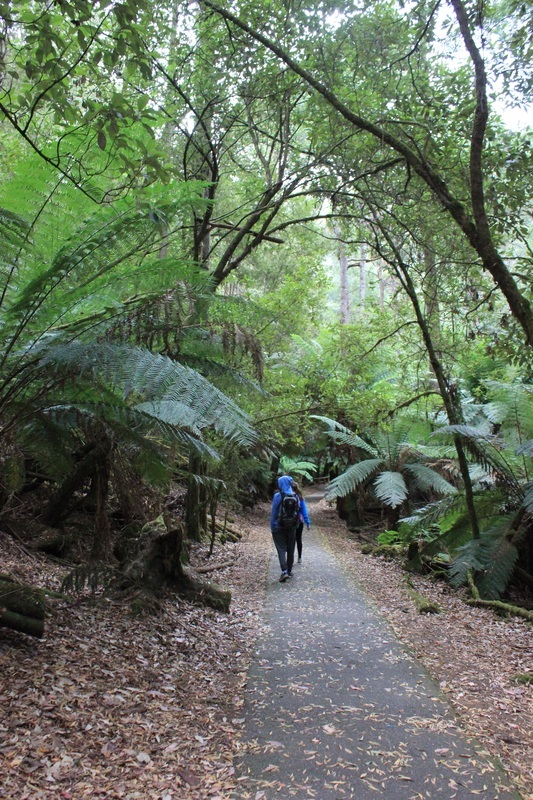 This is an easy walk that anyone can do, and takes you through very attractive ferns on a sealed path. 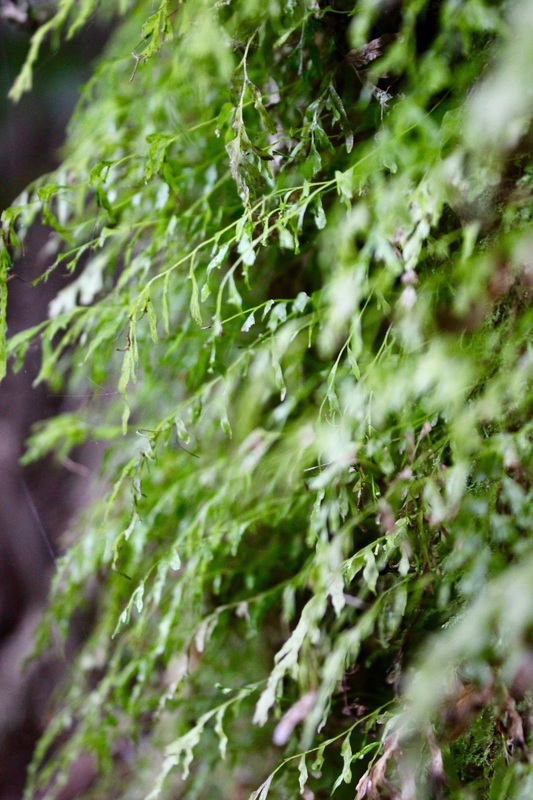 At night, this same pathway will allow you see glowworms scattered throughout the vegetation near the Falls. Just remember to turn off your torch before you get to where they are located (a sign will guide you when!). 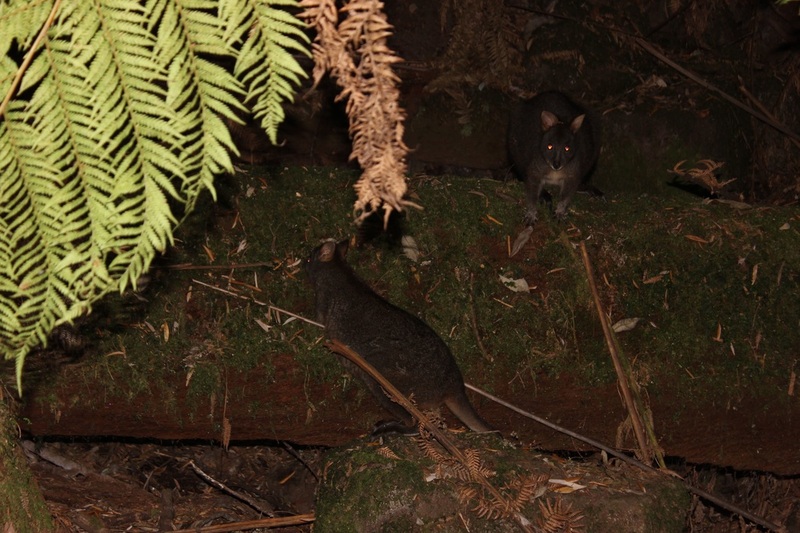 We were lucky enough to see a Tasmanian Devil on the path on one of our night time walks as well....it ran off before we could get a photo though. If time permits, a walk from Russell Falls through to Horseshoe Falls and Lady Barron Falls allows you see a lot more of the Park and see some of these giant Swamp Gums up close. It's well worth the effort. You can also drive up to Lake Dobson (16km from the Park entrance), and there are more walks up that way, but unfortunately we ran out of time and didn't drive up there. Next time! We heard from others how wonderful it was, and how spectacular some of the scenery is, so it's a pity we couldn't schedule it in.